The US, Canada, and Mexico's newly signed trade pact looks a lot like NAFTA. Here are the key differences between them. Leon Neal/Getty ImagesPresident Donald Trump and Canadian Prime Minister Justin Trudeau. Auto rules: Members must produce 75% of a car for it to pass through the countries duty-free, up from 62.5%. Additionally, 40% of each car must be produced by workers making $US16 an hour or more to avoid duties. Tariff side deals: The US came to side agreements with Mexico and Canada that would largely protect the two countries from tariffs on imported autos and auto parts. Canada would be allowed to ship 2.6 million cars to the US without tariffs, well above the 1.8 million it sent last year, and send $US32.4 billion worth of parts without getting hit by tariffs. Mexico’s deal was similar, except the country can send $US108 billion worth of parts. Commitment to not mess with currency levels:While the US, Mexico, and Canada do not actively intervene to strengthen or weaken their currencies, the pact to “achieve and maintain a market-determined exchange rate regime” could be a model for future agreements with countries that are more active in currency markets. Increase in the de minimis levels: The de minimis level is the amount of a good a person can take across the border without being hit with duties. 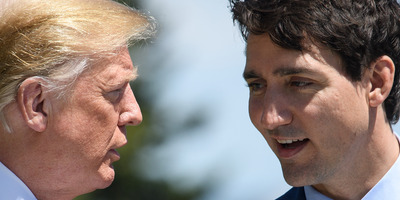 Canada will increase the de minimis level for US goods to 40 Canadian dollars from 20 Canadian dollars; for cross-border shipments like e-commerce, the level will be boosted to 150 Canadian dollars. Mexico will also bump its de minimis level to $US50 and duty-free shipments to $US117.